Can I take a train from Seattle or Vancouver to Alaska? Sadly, there is no rail connection through Canada to Alaska, but there are plenty of amazing ways to get here. There are four main ways to reach Alaska. By flying, by cruise ship, using the state ferry system or by driving the Alaska Highway through Canada. If your heart is set on train travel, don’t fret. 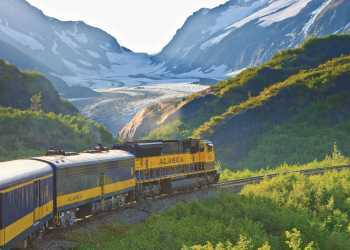 The Alaska Railroad has amazing trips connecting Anchorage to Seward, Whittier, Talkeetna, Denali National Park and Fairbanks. You can learn more about railroad tours throughout Alaska. The Alaska Marine Highway System is a state-operated ferry system. Many ships and routes make up the system. Summer service between Bellingham, Washington and Whittier, Alaska is the most direct route into Anchorage, and is usually served by the m/v Kennicott between April and the end of September. There is another way to travel from the U.S. through Canada and into Alaska: the Alaska Highway. The route traverses British Columbia and Yukon Territory before entering Alaska near. Keep in mind, you’ll need your passport if you chose to drive, both to enter Canada and to re-enter the U.S. at the Alaska border. How could we make this page more useful?